This page is dedicated to the New Puppy Owner and has some answers to questions ranging from feeding to the Pomeranian Puppy scraggily stage! ALSO: Switching foods is not only stressful on a new puppy's stomach, but so is switching water at times. We suggest that you buy a gallon of bottled water and gradually mix it with tap water to let your puppy adjust to it. Stress, new surrounding, a trip to his new home and new food and water can cause stomach upset and loose stools. After a week your new puppy should feel right at home and do well with his new family and surroundings. POTTY TRAINING: We also start your new puppy on paper training before you take her home. Its very important to be persistent in training your new baby. If puppy has an accident you can keep a bottle of water mixed with vinegar to hide the scent so puppy wont go back to the scene. I dont like to let my puppies outside until all vaccines are completed but you can have a designated area where your puppy can relieve himself and become familiar with. When you get your new puppy home he will have had his first set of vaccinations and a series of wormings. I provide you with a schedule of vaccines due and you can take that with you to your Veterinarian to keep track on when they are due. ***It is extremely important that you keep up with ALL vaccinations as puppies need to be protected from diseases. *** I always keep my pups away from shoes, other dogs and parks until all vaccinations are completed. When your puppy has completed his series of puppy vaccinations, he will need to go back for his yearly exam and booster shot. Please do this on schedule, a little prevention goes a long way and will keep your Pom healthy and happy! When you purchased your new Pomeranian Puppy you received an application to register your puppy with the AKC (American Kennel Club). You need to fill out the name you wish to be on your pups paper. If your puppy is sold with limited AKC registration I will check the limited registration box. Limited means you can not register a litter from this Pomeranian if he/she is bred. Full registration means that your new Pom can register future litters with the AKC. 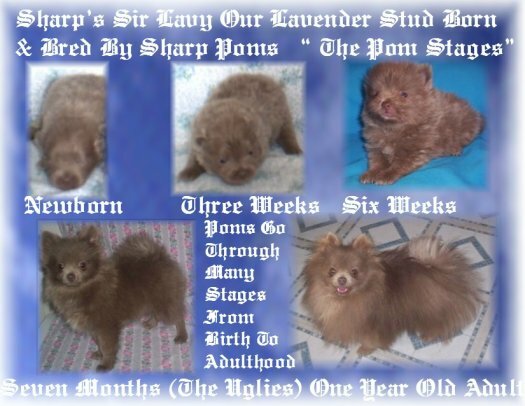 This little collage is just a look at some of the changes your new Pom puppy will go through. They lose there puppy coat at about 4 months old and go through a stage sometimes referred to as the "Uglies". Not to worry, your Pomeranian will blossom in time, most coats come in around 9 months though some take a bit longer. Also with this change you may see a change in the color of your Pom. This is normal and happens quite often in Blue Sables and some other colors. They may get lighter or darker as there adult coat comes in. As you can see, your newborn Pom puppy makes many changes in appearance the first year. They are beautiful little dogs and once you own one you always will! They are beautiful, intelligent, loving companions and all of our puppies are socialized from day one. As Sharp Poms slogan has always been, "Lovingly Raised From Our Family To Yours!" Thank you for stopping by our website, we hope you have a Blessed Day!